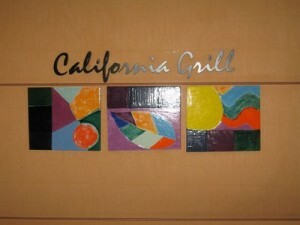 Description: The California Grill is located on the mysterious 15th floor of the Contemporary Resort. You will check in for your reservation on the second floor and then you will be escorted to the restaurant via private elevator. The views here are magnificent and if you are lucky enough to be dining during the Magic Kingdoms “Wishes” fireworks display you are in for a real treat. As a bonus, guests who have dined at the grill earlier in the evening may retain their receipts and can come back up to view the fireworks. The Food: The California Grill offers up an eclectic menu but is best known for its sushi and other freshly prepared dishes. You will also be impressed with their designer flat breads, and entrees such as Cast Iron Seared Bison and Florida Snapper. California wines are featured and pairings are available. Children can feast on Macaroni and Cheese or Pizza but can also be more adventurous with dishes such as salmon and roast chicken. Dining Plan: The DDP is accepted. This is a Signature Dining location so will cost you 2 table service credits if using the dining plan. This entry was posted in Dining and Restaurants, Dining plan, Restaurant Spotlight and tagged California Grill, dining plan, Signature Dining. Bookmark the permalink.